I think I might have lived on the lychee for the entire weekend. Well almost. 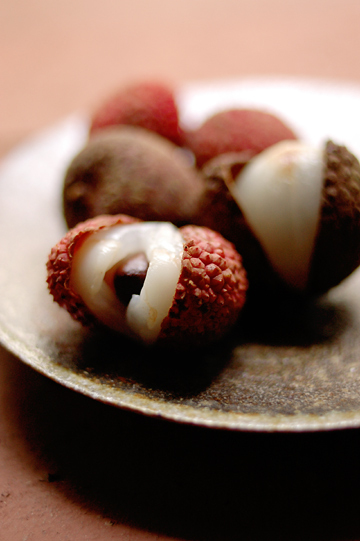 Over the past years, fresh lychee nuts are becoming increasingly common at stores in Tokyo, even if they are only around for a short period of time. 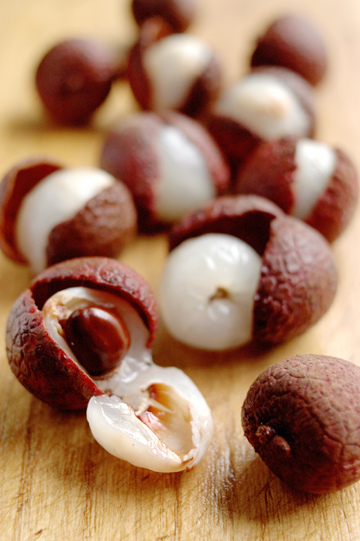 Almost all fresh lychee nuts sold around here seem to be imported from Taiwan, but this year I found ones from Okinawa, the (mostly) southwesternmost islands of Japan that themselves are quite close to Taiwan. Pictured above are lychees from Taiwan and Okinawa; the larger, browner ones from the former while the smaller and spikier, bright red ones from the latter. Lychees we see here are usually like the brown ones, and I'd never seen such small, red lychees in Tokyo - although ones I'd see in Hawaii were more or less like this Okinawan kind. I'm guessing it is a matter of freshness; I've never seen them on the tree, but I suspect they are probably bright pinky red and have spiky shell right after they are harvested, then both the skin color and spikes become duller over the course of shipping. Okinawa may be almost as far from Tokyo as Taiwan is (I said almost! ), but it is still in the same country and their produce now do not have to go through the elaborate quarantine process like those imported, thus arriving at stores faster. But I could be wrong. Either way, the two kinds look pretty much the same once peeled; beneath the rough skin hides the almost translucent white flesh, which envelopes a single, large pit in the middle. 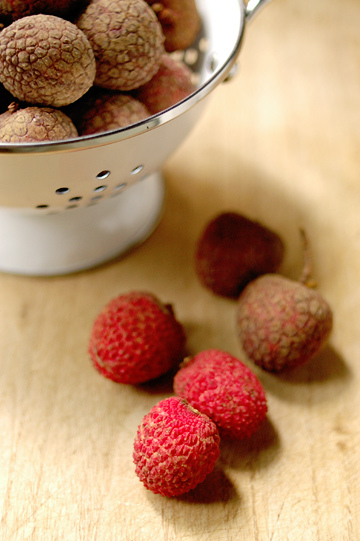 My Okinawan lychees were a lot juicier, but the Taiwanese ones were sweeter and tasted riper. Both good, though. The lychee may be one fruit that is best eaten fresh, but as always, I just couldn't help but try and make something with them. In the past I used them in gelatin dessert, pudding, compote and even crumble, some of which have been documented here. This year, I attempted to bring things a bit further into the dessertdom. 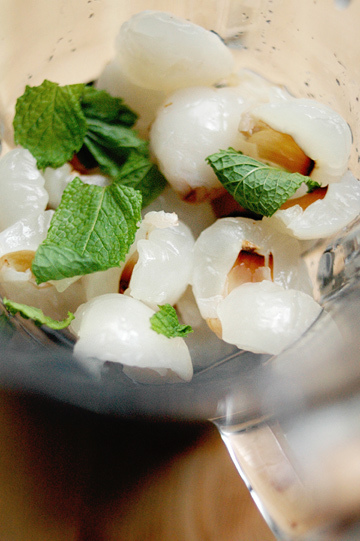 With a pile of (imported) lychee nuts to begin with, I spent some intense Lychee & Me time over the weekend. 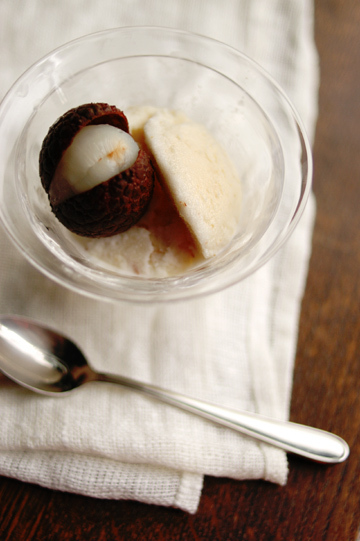 And lychee ice-cream, yes. I've made two kinds so far - or three, depending on how you see it. I realize it is almost impossible to tell so from this picture, but these two are different lychee ice-cream. One is flavored with lemon grass, and the other with ginger. When I was searching for a lychee ice-cream recipe, I stumbled upon this one for lemon grass and lychee ice cream, which I thought was great. Well, until I noticed that egg yolks are missing from the list of ingredients. Judging from the amount of other ingredients such as milk and cream, I could guess roughly how many egg yolks should be used (twelve, perhaps? ), but I just abandoned the whole idea of using eggs and just borrowed the lemon grass bit, using another ice-cream recipe. Then I made the ice-cream base, by warming milk, cream, sugar and a few stalks of fresh lemon grass that have been bruised (to extract more oil) and cut. Once the cream mixture has been heated and then cooled to room temperature, I put it in the fridge to chill, then in the blender to whip it up a bit before it went into the freezer. 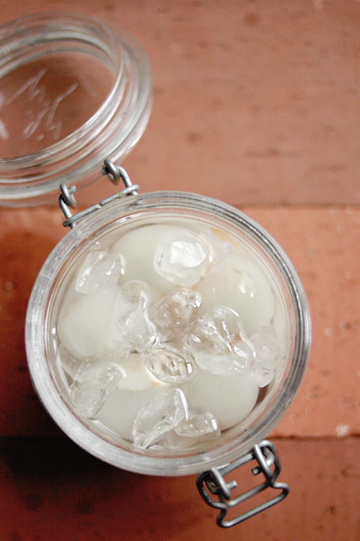 When the mixture was half frozen, I gave it another whiz in the blender, and added chopped lychee flesh that had been mixed with a bit of sugar and kept chilled. Well, that was what I did for my second trial of the recipe. If I had an ice-cream machine, I'd have simply mixed the cream mixture and lychees before churning them together in the machine. But since I didn't (and still don't), this time I added the lychee pieces only after the final blender run, otherwise the fruits would have been chopped into fine pieces and blended into the ice-cream base. And that was exactly what happened in my first trial. That first batch, in fact, made a good, smooth ice-cream full of lychee flavor, although the texture was a bit like that of sorbet rather than creamy ice-cream. 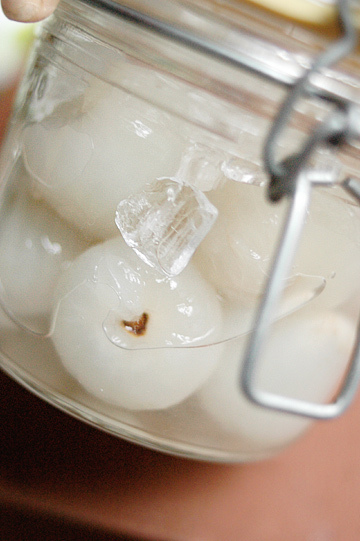 So I added the fruit flesh at the very last in my second batch so the lychee pieces would hold their shape. They did, but you know what? I liked my first batch better. 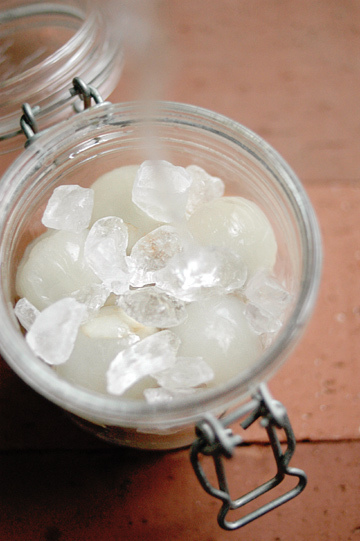 As it turned out, I didn't like the texture of frozen lychee flesh too much; fresh fruits, when simply frozen, tend to become too icy and hard to bite. I should probably have cooked the fruits in syrup first to reserve a better texture when frozen, but I'd just use canned lychees, then. So when I made the other lychee ice-cream with ginger, I went straight ahead and processed lychee flesh together with the ice-cream mixture, even if the recipe said otherwise. 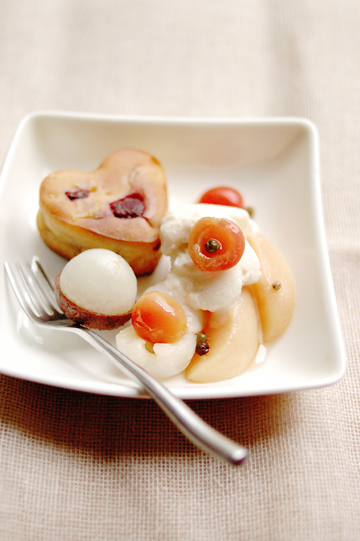 The recipe I used is this, a French recipe for glace aux litchis. Now the first one was fairly simple to make, but this second one required hardly any work - other than peeling and pitting lychees, of course. There are only three ingredients listed: lychees, sugar, and evaporated milk. That's it. No eggs, no cream. And all you need to do is to 'beat the evaporated milk until thick' - by the way, I never knew you could whip up evaporated milk to make it thick! - and add sugar and lychees, and in my case, a bit of juice of fresh ginger. As simple as it may have been, I did have some minor issues - like, I had no idea as to how large a 'large can of evaporated milk' is in France. I googled a bit, and assumed it would be about the same as ones we have in Japan (approx. 12-14 oz. / 350-400 g), but not really sure. I also used fresh lychees instead of those in syrup as called for in the recipe, without adjusting the amount of sugar to add. So it is highly possible that I ended up with something completely different from the one intended in the recipe, but mine turned out just fine. Actually, it was more than just fine; in fact, it made a fabulous ice-cream - smooth and creamy, sweet but not overly so, with a hint of condensed milk taste, while the flavor of lychee shined through. I had never tried an ice-cream recipe that uses evaporated milk in place of cream or regular milk, but I think I'd play around with it, using other fruits. Overall, my lychee ice-cream experiment has been a success, in spite of a couple of mishaps, including one ruined batch that miserably curdled up due to overprocessing in the blender (sigh). Both lemon grass and ginger paired well with lychee, though the herb may have been a little too subtle. 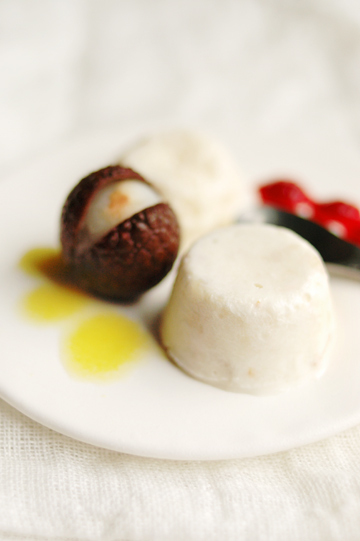 Both kinds of ice-cream tasted great as is, but I tried and gave them a little more sophisticated look by molding the mixtures in mini muffin pans and served the icy morsels with fruit sauce - mango for the lemon grass one, and raspberry for the ginger. The ice-cream was on the top of my list of things to make with the lychee, and I was quietly content with my own creations. But I did not stop there; I still had a few more recipes to go (and still a lot of lychees to use up) before I could be done with my experiments. Good news was, everything was far easier to make than the simple ice-cream I'd made. 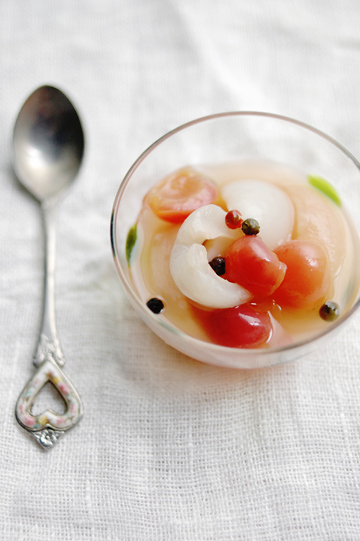 One was a simple fruit compote: lychee, cherry, and peach compote with mixed peppercorns. This really is a simple one - you simply poach the fruits in white wine with honey and mixed peppercorns. And by 'poaching', I really mean 'heating the fruits in the liquid just until they are warm' here; you don't want to overcook any of these fruits. Of the three I used, peach would need a tad longer to cook, so I started with sliced white peaches alone, gently simmering them in white wine with peppercorns for a few minutes. Then I added halved and pitted lychees and cherries, as well as a bit of honey, shimmered for another minute or so, and removed from heat to let it cool to room temperature. And I chilled in the fridge to let the flavor develop. The compote tasted light and refreshing, sweet to a degree that was just right, with a subtle kick from the peppercorns. The liquid turned slightly pinky, taking on the color of white peaches - I thought about using a rose rather than white wine, but I didn't need to! 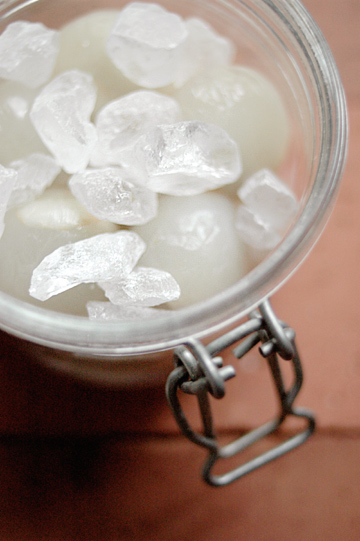 Now the lychee seems to be used mostly in chilled/frozen desserts, but I wanted to use them in baking, too. I've made lychee crumble in the past, along with other fruits such as mango and papaya, but this time I went for cakes. I made French-style yogurt cake, or gateau au yaourt, which I have made using several different recipes with several different fruits, including figs, apples, and blueberries. 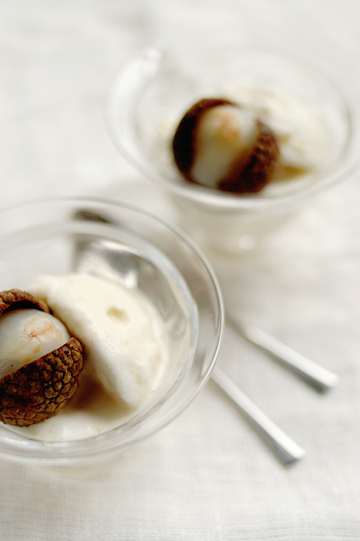 This time I used this recipe, also from the French recipe site as one for the ice-cream. It was fairly simple to make, and the batter was ready in no time. As I peeled (yet more) lychee nuts, I thought I'd add raspberries, too - I had some in the freezer, and lychee and raspberry are a classic combo, so why not? I took some berries out of freezer to thaw them a bit before throwing them in to the muffin pan along with chopped lychee flesh. Now you may or may not know about my crappy oven, but if you allow me to make a repetition just to make my point clear: in most of my baking attempts, I need to flip over whatever I'm baking in the oven halfway through the baking, and I usually need to double the baking time, too. As a result, by the time they are done with cooking, lots of my baked goods come out of oven looking flat on the surface; I could pretend to call them upside-down cakes, but that would be pushing the envelope a little too far, I reckon. So my upside-down cakes - I mean, yogurt cakes with lychee and raspberry, weren't looking exactly pretty, but tasted quite good, although they were more like pudding than cake. It might have something to do with the higher-than-normal content of yogurt (or lower-than-normal content of flour, more precisely), but I'm not sure. Lychee and raspberry yogurt cake with lychee-ginger ice-cream and fruit compote: a lychee overflow! The ice-cream went extremely well with both the cake and compote, by the way. There is a hugely popular lychee liqueur in Japan called Dita Lychee, which I've believed is from France as the label says 'Produce of France'. But according to what I've just found on manufacturer's website, it is from France but available only in a handful of Asian countries. I suspect it is basically the same as the one called Soho Lychee, but I can't be sure. 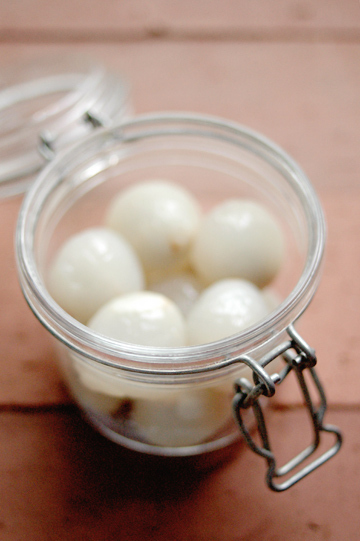 Anyhow, I'm among the many who fancy Dita around here, and when I first came across the idea of making your own 'Dita' by infusing vodka with fresh lychees some time ago over at one beautiful Japanese blog, I swooned. Then I cursed myself, for not having come up with the idea before. And then I sobbed, for not being able to try it right away, because the fresh lychee season was long way off as I read it. I vowed to try it as soon as I lay my hands on them. Time passed by, and come the following summer I ended up not having lychees at all - I was away on my travels for the entire month of June, trading a rainy Tokyo with summery Paris and London (there are some photos from the trip here, if you are interested). So my Dita had to wait another year. And wait I did. Well, I must admit that I had happily forgotten about it for the better part of the twelve months, but as soon as I saw fresh lychees at the store a few weeks ago, I started fidgeting. 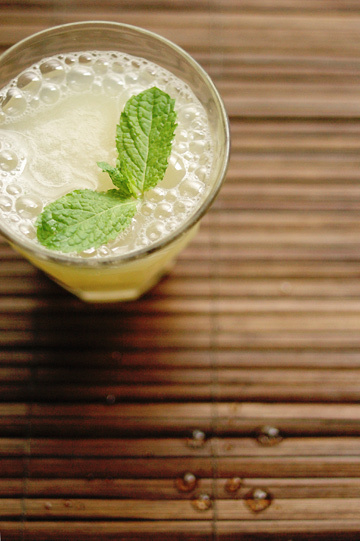 As far as preparations go, it's quite simple to infuse booze with fruits. Most of the time, you simply place good fruits, and alcohol (vodka, brandy, whiskey, etc.) in a jar, often with sugar and sometimes with spices. I never used to do much infusing myself, other than the pretty peach cordial I did a long time ago. (I did some last summer and autumn while at my mother's in Nagano, but it's another story....) Anyway, none of the recipes I'd tried myself is from Japan, and this was my first time doing it a 'Japanese way', which is to use rock candy rather than granulated sugar. Even though I never really did it myself, I still knew people use rock candy for home-made 'fruit liqueurs'. 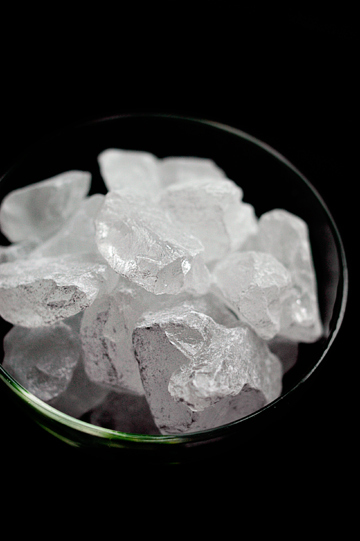 As a kid, I remember stealing pieces of rock candy off a bag my mother would keep in the kitchen to use in infusing neutral-tasting shochu, the most-favored spirit for infusion in Japan. That was about the only time I'd have those large pieces of rock candy. 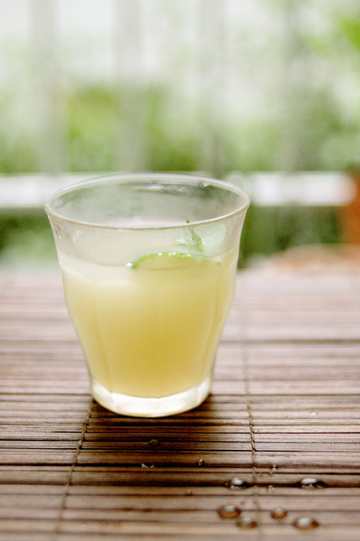 People use it because it is said to be better at extracting the flavor of fruits placed in alcohol. So I bought a small bag of 'natural' rock candy, made from cane sugar and with no added flavor or color. Then, I had some issues (of course). I had lychees; I had rock candy; and I had vodka... or so I thought. As I had the fruits and sugar ready in a jar, a bottle of what I thought was vodka that I'd bought the day before turned out to be... gin. I gasped. I so wanted to blame my husband for getting me the wrong bottle, but it was me myself that grabbed that wrong bottle, and I don't even have a husband, for that matter. How could I have been such an idiot? I don't know. Ask my husband (I wish). Now gin is definitely my favorite spirit to drink (albeit only occasionally), but having such a strong and distinctive flavor on its own, would it make an ideal vehicle to steep a delicate fruit like lychee in? I was negative. But everything else was ready, and it was pouring rain outside and I really didn't want to go out just to buy a booze. So I just did what I could; go with gin. Other than having to use the wrong choice of spirit, I also had to do something that wasn't totally ideal; using a jar that was too small. That was the only clean glass jar I had around at the moment, as I had forgotten to buy one (and it was pouring outside, thankyouverymuch). 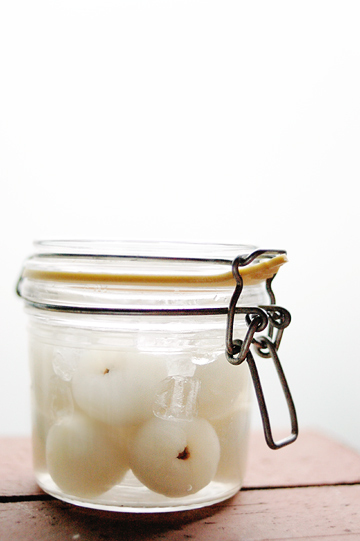 I guess I only used about ten lychees, and the jar could now hold only about half a cup of gin. Which meant I wasn't going to have a lot of 'Dita', whether or not it turns out good. But honestly, I'm not that worried. It should come out good, if not too lychee-y; if worst comes worse, I'd just have a bit of slightly sweet gin, that's all. So I'm quite excited to find out how it will taste like in a couple of months' time. Then again, I still couldn't abandon my hope to make my own Dita, and bought a bottle of vodka (I checked it thrice before putting it in the basket) and some more lychees (which could be my last lot for this year), to make a 'proper' lyche liqueur. In any case, I had to wait for some time before I get to taste it, and I wanted something that can go down right away. So I put some more lychees in the blender along with mint leaves and whiz them up to make puree, then strained it through a sieve and poured into a glass, which was to be topped with champagne. Well, that was a plan. I had found this recipe for Lychee Mint Champagne and had quickly been sold, so I had bought a bottle of sparkling wine and chilled it in the fridge. But the wet and overcast day that was somehow made me feel like staying away from alcohol, and I decided to do it with ginger ale instead. (Ginger ale, if you ask me, goes well pretty much with anything.) Never mind I did have to go out in the rain just to buy a bottle of that stuff, getting completely soaked up. But my pain paid off. It indeed was the winner. 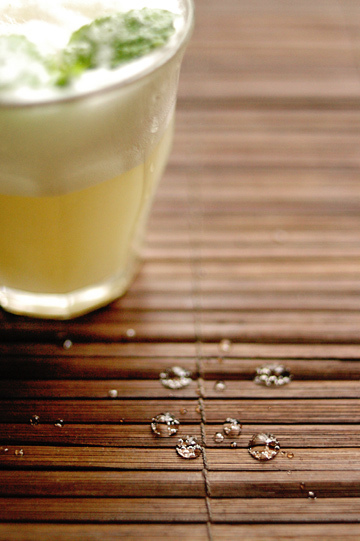 Zingy ginger complemented the sweet and mellow lychee well, and exhilarating mint made the drink taste even more clear and refreshing, making it a perfect fizzwater on a rainy day like that. For a moment, really, a wet day seemed not as gloomy as it often is. After all, the lychee season almost exactly coincides with the monsoon season for us, and sometimes we do need something to remind us that we should appreciate the rain. And cheer us up a little, too. That said, I'm looking forward to trying this with sparkling wine, preferably on a sunny (and hopefully not too warm) day on a weekend. Am I asking too much? miss chika! what beautiful photographs. i would love to try some of your experiments, but have yet to see lychees in the local market. maybe when i get to manila, where they are plentiful. wow! you have placed lychee at a higher level. :) nice post. not a big fan of lychee, but this one... makes me think of it differently. lychee in a cake? cool! 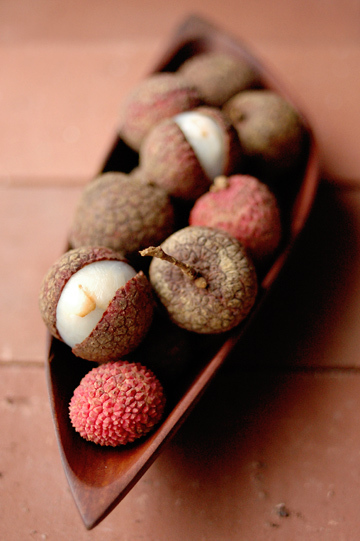 the lychees we find in singapore are usually the taiwanese version. (the japanese version would be too expensive i supposed) we also have those with smaller seeds but have a greenish skin and look "unripe" though are perfectly fine to eat, if not a little bit more astringent. I love lychees. They are so underrated! And your photography here is lovely! OMG! Your photography is awesome! And I'm such a big fan of lychees....I could polish off an entire kilo in one afternoon really....and have done so in the past a number of times! I love lychees, they are a really underrated fruit! Hello there, thank you all for your comments! I don't see fresh lychees any more where I am, but I hope you've treated yourself to a good dose of lychee - let's see them next year! Amazing, amazing and amazing post. My daughter is totally crazy for lychees and I always buy them for her even if they cost a lot, a lot, around here. They come from Vietnam and are not always good. We always had delicious lychees in Brazil and we had a little lychee tree in our garden in a house outside Sao Paulo, Brazil. It never really produced any fruit because it was quite small, but our neighbor, who gave us the little tree, had a huge one which produced lots of fruits every year. Anyway, the entire post was so inviting and passionate. 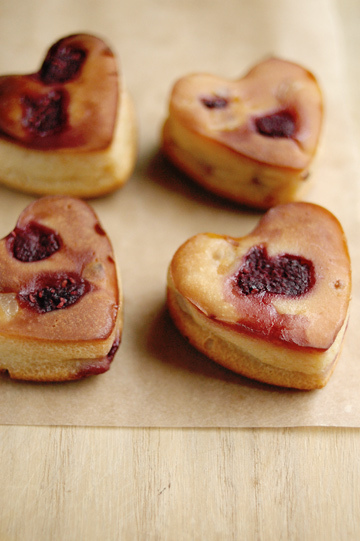 Those little yogurt cakes, oh, gosh I love your posts.